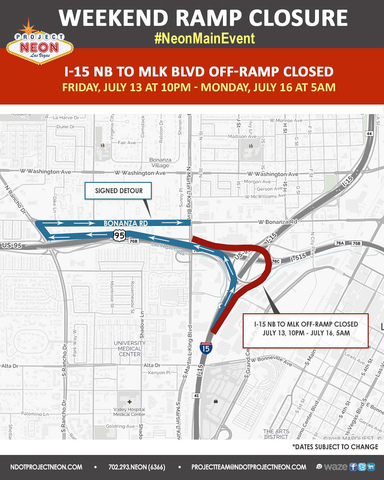 The northbound Interstate 15 offramp to Martin Luther King Boulevard will close from 10 p.m., July 13, until 5 a.m., July 16, according to the Nevada Department of Transportation. NDOT says that they need to close the offramp for demolition work related to "The Main Event," which is the third and final phase of Project Neon. The demolished concrete will be screened, crushed, and reused as fill material as part of the project's commitment to sustainability and the environment. Project Neon is a $1 billion 4-mile-long widening of Interstate 15 from the U.S. 95 interchange to Sahara Avenue. NDOT says the project involves the construction of 28 new bridges due to age and capacity. So far half of the bridges are finished. NDOT provided an alternative route to get around the closure, which you can view below.